It was all about the horses Saturday night in Calistoga. Aaragon, a 10-year-old registered purebred Morgan, was giving out horoscopes and dances for $10 a pop, while Finnegan, a 2-year-old colt, entertained a crowd of about 180 people by playing with a huge rubber ball in a horse corral. The two were joined by a third rescued horse, Blitzen, a 9-year-old American Mustang who was found in deplorable conditions in the city of Napa. They were the stars at Saturday’s Harvest of Hope, a fundraising benefit for St. Helena’s Sunrise Horse Rescue that was held at Calistoga’s Blossom Creek Farm. The event included a silent and live auction, a dressage and a 3 Day Eventing demonstration by the husband-and-wife team of Matt Brown and Cecily Clark and a family-style feast for 180 people. It also included a touching video about the horses and the volunteers at the St. Helena nonprofit that had many in the crowd in tears. 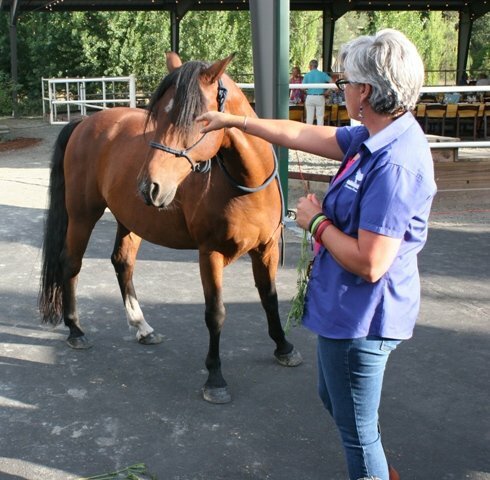 Lisa O’Connor, board president of Sunrise Horse Rescue, said the event grossed $95,000, which will mean between $68,000 and $69,000 for the group. 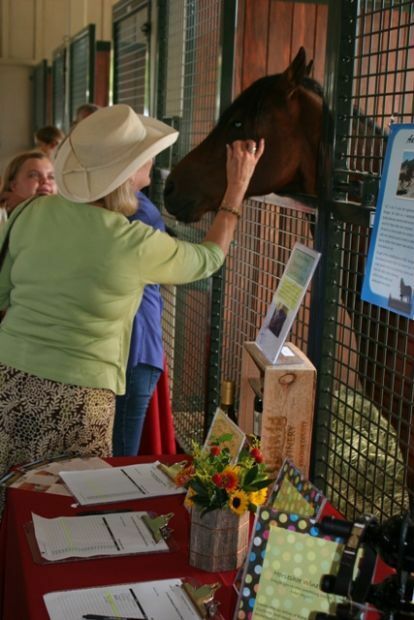 On Monday afternoon, she said it’s important to note that the nonprofit provides care for 15 horses, and it costs “very conservatively” about $6,000 a year per horse, or $90,000 a year for all 15. “So actually, we’re not meeting our operating budget and still appreciate any donations,” she said. The live auction raised $47,600 for its eight lots, while the Fund-A-Need raised $21,300. The proceeds from the Fund-A-Need will be used to help Sunrise Horse Rescue find property to build a new facility with permanent barns for its horses. A couple of weeks ago, O’Connor estimated that the group would need between 10 and 20 acres of land, preferably in Upvalley area, since that is where most of the group’s volunteers live. The volunteers were honored Saturday night, and Sunrise Horse Rescue couldn’t operate without their volunteers and their two paid employees, one to feed the horses in the morning and the other to clean stalls and maintain the corrals and fencing. Before the live auction, Clark and her horse, Ringwood Galaxy, showed their skill at dressage, while Brown rode his new horse, BCF Belicoso, and showed their skills at 3 Day Eventing, which includes dressage, jumping and cross-country tests. Both have been riding horses since they were 6 years old, and Brown hopes to train BCF Belicoso to compete in the 2016 Summer Olympics in Rio de Janeiro. Bakersfield auctioneer Mike Grigg started the live auction off with everyone raising their paddles in a “Rubber Chicken” match. As he raised the stakes from $5 to $50 to hundreds of dollars, paddles were lowered. The rubber chicken sold for $850, much to the amusement of the 180 people seated in the open barn at Blossom Creek Farm. Grigg doubled three of the lots as two people were trying to outbid each other. He sold two “East Coast Equestrian Adventures” for $4,250 each, raising $8,500, and sold two lunches for 20 people at the Napa Valley Cooking School for $4,000 each, raising $8,000. Chef Barbara Alexander told the crowd the lunches would be served in the kitchen during the Christmas season. “It’s so much better than Meadowood and so much cheaper,” she said, “And don’t even mention the Laundry!” Bidding started at $500 and quickly went to $2,250. At the $3,600 level, the crowd started to applaud, and as bids reached $4,000, many in the crowd cheered. The top lot was for a six-day, six-night African safari. Bidding started at $1,000, but quickly went to $4,000 and then to $7,000. By that time, it was clear two people wanted the safari, and the bids went to $7,500 and then a thousand more. At that point, Grigg appeared to sell the trip for $8,750, but instead knocked off $500 on the bid and sold two trips, one to each bidder, raising $16,500. Other auction lots included a boat trip with lunch aboard the SS Bubbles, courtesy of St. Helena Mayor Ann Nevero and her husband, Tim Nieman, which sold for $1,250; an original painting by St. Helenan Matt Rogers, which was donated by Blossom Creek Farm owner Bob Fish, who then bought it back for $6,000; and a one-of-a-kind horse painting by Calistoga artist Tom Scheibal, who attended the event. It sold for $3,000.